Santander Airport is the main airport to Santander and Cantabria. It lies on the bay of Santander just a short distance south from the city. 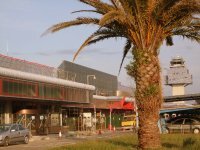 From the airport there are Alsa busses that take you to the bus station in the centre of town. The bus station is in front of the train station in 10 minutes. The bus stop is on the rightside, when you leave the airport. A ride costs €2, and busses run approximately every 10 to 15 minutes. The same is true for the other direction. At the airport there is only 1 terminal, making it easy to get around. The airport is being extended at the moment of writing, but the airport will not become huge. Ryanair - Brussels - South Charleroi, Dublin, Frankfurt-Hahn, London Stansted, Madrid, Milan-Orio al Serio, Pisa, Airport Weeze (near Düsseldorf and Rome. Ryanair also has a couple of inland flights to Madrid, Alicante and Reus (in between Barcelona and Valencia. Iberia's sister company Air Nostrum has flights Barcelona, Las Palmas de Gran Canaria, Madrid, Málaga, Palma de Mallorca, Seville and Valencia. One thing to do before going through the security check, it going to the toilet. After the check there are no toilets in the waiting area. For accommodation check the page for the city of Santander. This is version 6. Last edited at 12:30 on Jun 24, 13 by Sander. 2 articles link to this page.